Sixteen communities drawn from Warri South, Warri South -West, Uvwie and Okpe Local Government Areas in Delta State, are to battle for the ultimate prize in the 3rd edition of Olu of Warri Community Peace Cup 2018, taking place in Warri from Wednesday November 21, Fresh Angle International can authoritatively report. The Director / Head Coach of JOETIA FC, Toritseju Samuel Igbiaye, who is organizer of the annual communities' football fiesta, told Our Correspondent in Warri that the 16 communities have been drawn into four groups, with the kick off taking place November 21 simultaneously by 4pm at four centres: Nana College Field for group A, Ubeji Primary School Field for group B games,Yonwuren College Field for group C encounters and former Rice Farm along Esisi Road for group D games, all in the Oil City of Warri. The participating communities are: Ugbo-Oloja, Ughoton, Ode-Itsekiri, Effurun Barrack (Group A) Ubeji, Ifie, Iyatsere, Ugbokodo (Group B) Ugbuwangue, Orugbo, Ogunu, Kantu (Group C) Bateren, Ugbodede, Alders Town and Ogbe-Ijaw (Group D). 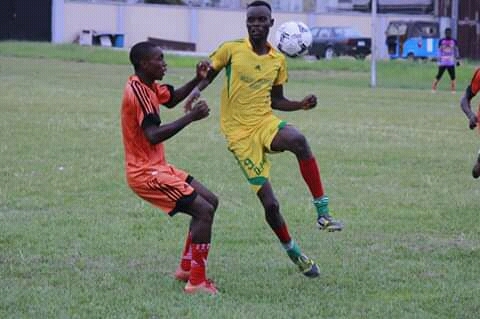 According to Mr. Igbiaye, the competition whose final will hold December 9 at Nana College Field, is being put together in collaboration with Ogunmola Football Club,Warri and have the support of Fresh Angle International Newspaper Warri, Rize FM Warri and Delta Broadcasting Service Warri Sports Unit as media partners. Your Soaring International Tabloid gathered that NFF President, Amaju Melvin Pinnick, ex-International, Edema Fuludu, former Delta State Governor, Dr. Emmanuel Uduaghan, chairman of Warri South Local Government Area, Dr. Michael Tidi and Chief Emmanuel Uduaghan are among dignitaries expected to grace this year's tournament. Fixtures for November 21 (Day one) will see Ugbo-Oloja do battle with Ughoton at Nana College Field, Ubeji slugging it out with Ifie at Ubeji Primary School Field and Ugbuwangue going head-to-head with neighboring Orugbo at Yonwuren College Field, Ugbuwangue, while group D will feature a confrontation of who holds the ace among two coastal communities: Bateren and Ugbodede.